Hispanic culture, a jumbo city park plus cool bars and restaurants draw locals and visitors to this upper northwest hot zone. 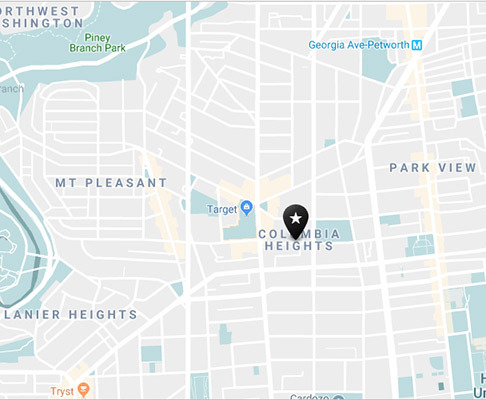 With its mix of grand and humble historic buildings (rowhouses, embassies along 16th Street NW), Columbia Heights reels in a mix of creatives, international professionals and, thanks to its leafy parks, bikers and picnickers. It’s one of DC’s most densely populated 'hoods, too, supporting a swath of homey restaurants and bars. Plus, a longtime Hispanic population means attractions like the GALA Hispanic Theater and the Mexican Cultural Institute lend the area a multiculti vibe. The area’s main drags are 11th, 14th and 16th streets starting at U Street NW. Along 16th Street, you’ll find embassies and international organizations, most housed in impressive early 19th-century structures with architectural flourishes – turrets, stained glass, balconies. You can check out exhibits on south-of-the-border art and life at the Mexican Cultural Institute, housed in a grand mansion (and one-time Embassy of Mexico) with a mural of that country’s history painted on its interior stairway. Nearby, Meridian Hill Park, a two-level, European style park with terrazzo walls holds fountains, statues and, every Sunday, a lively afternoon drum circle. Restaurants and bars along buzzing 14th Street and mellower 11th Street fill up with young professionals and stroller-pushing families, particularly on weekends. Consider hot spots like Room 11 for cocktails, small plates and breakfast, Thip Khao for the only place in DC to try Laos’ spicy curries and rice dishes and Bad Saint for Filipino cuisine in a cozy, laid-back neighborhood setting. The area, and neighboring ‘hood Mount Pleasant, are ideal for exploring by bike, especially since multiple Capital Bikeshare stations can be found in the vicinity. Just be warned; the area is hilly! Meridian Hill Park on sunny Sundays, Le Caprice Bakery for French pastries, Sticky Fingers for tasty vegan eats. Metro’s Green and Yellow lines stop in the heart of Columbia Heights. The area is also services by multiple bus lines, including the S lines on 16th Street NW and the 52-54 bus lines on 14th Street NW. Discover all of the things to do and places to eat drawing locals and visitors to this thriving upper northwest neighborhood.